Altai Mountain goats are uniform in colour, size, conformation and wool production. They are noted for strong constitution and adaptability to the severe conditions of extensive husbandry in the highlands. They have a relatively high live weight and good meat qualities and are able to fatten rapidly during a short summer period. Altai Mountain goats are superior to local ones in live weight (5-10 kg more) and wool yield (3-4 times more). Live weight of males is 65-70 kg and that of females is 41-44 kg. 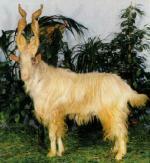 However, like local Altai goats, they mature rather slowly and grow till the age of 5-5.5 years. Wool of Altai Mountain goats has high technical qualities and is a valuable commodity for light industry. The guard hair is black and true wool dark grey. 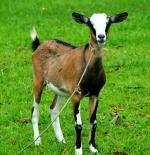 Laboratory data show that the true length of wool fibres in pedigree goats is 7.5-10 cm. The average diameter is 16-17 µm in adult goats and 15-16 µm in young animals. There is no apparent difference in wool fineness between flanks and thighs. Guard-hairs diameter is 75-90 µm. Wool content in the fleece of pedigree animals is 65-70%. Uniformity between them is not greater than 10%. Wool yields are 600-900 g for males and 450-600 g for females. Fibre length is 8-9 cm for both. The viability of goats in conditions of extensive husbandry is quite satisfactory. The year-round maintenance on pastures does not lead to deterioration of the quality (strength, length, fineness) of the wool, because it grows in seasons which are favorable in terms of feeding. 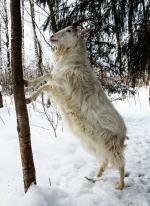 For Altai Mountain goats, the breaking length of wool (with 16-20 um diameter) is 9-9.5 km. For comparison, Merino wool up to 1/23 µm in diameter is considered strong enough if its breaking length is not less than 7 cm. 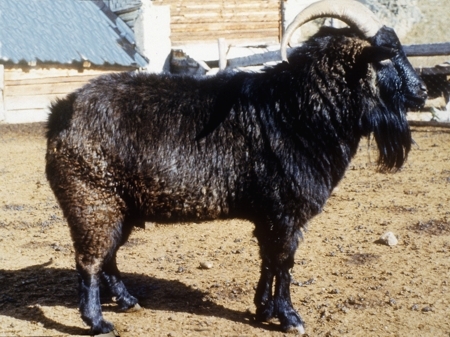 Breeding of Altai Mountain goats is directed to enlargement of the pedigree goat population and to increase of wool production and live weight, without losing the good adaptability to the special conditions of Siberia. Pedigree goats are also raised for sale to other farms. This work is done mainly in the collective farm 50 Years of the USSR in Kosh-Agach district and in the state farm Edigansky in Shebalin district. In recent years this state farm has made a certain progress in raising young pedigree goats. The goat population increased from 7,700 in 1970 to 9,900 in 1983, and cashmere production rose from 2,600 to 3,840 kg.